Kadek has been a part of Asialink family since 1997. She started her journey in the tourism world since 1994, and likes it ever since. She got a nice first impression in the tourism industry that brought her to travel to some beautiful places in Indonesia. The thing that she never had before when she was still a student in Udayana University. 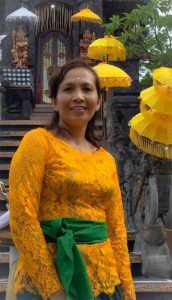 A traveling experience to Flores in 1997 made her commit to work longer in tourism industry, to know more about beautiful Indonesia and contribute to tourism industry. A young Kadek who is majoring Economic and Accounting, built her career from zero to hero. She started as an administration staff and now she is assigned as a group controller, managing the finance in Asialink Indonesia and Thailand. She loves her job because she got many positive things from it. She gets to know more about culture, destinations, and trends in tourism industry. She could enlarge her capacity by joining in various kinds of trainings held by Asialink. And not to mention, the dynamic colleagues in both headquarter and branch offices also add positive values in Kadek’s work life. Overall, she loves her career in tourism industry and hopes that the tourism in South East Asia will grow so many other people will also get the benefit, just like her.